Completed 1975 as Felipes for STUK. 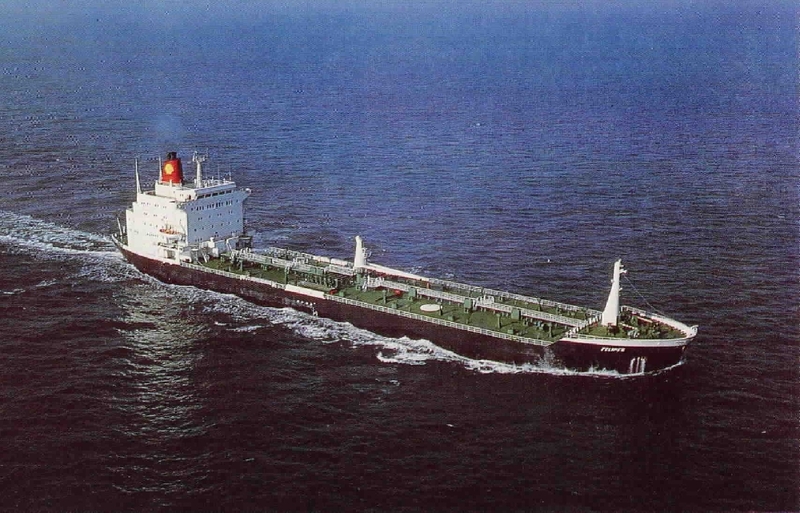 1979 to Shell Tankers Rotterdam. 1989 sold to Gefion Tank Owners Danmark and renamed Gefion Pacific. 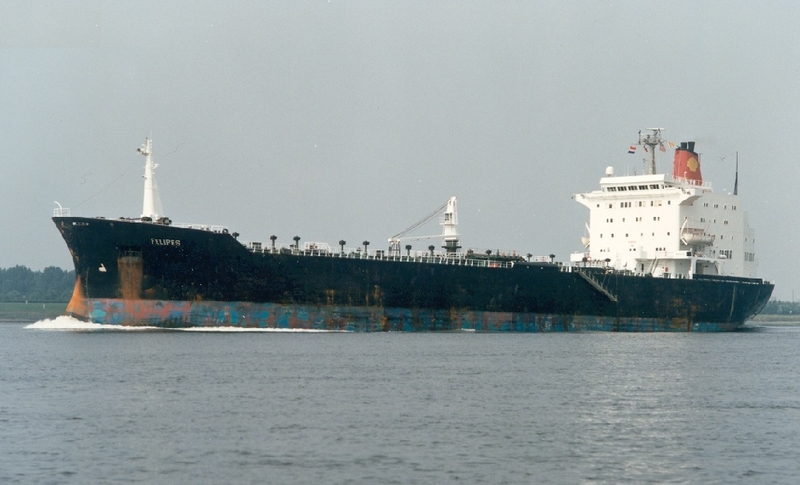 1992 sold Ocean Tankers Singapore and renamed Ocean Onyx. 2001 renamed Onyx. 15-12-2004 arrived Bolivia for scrap. Rick Vince 1 gp 2 1976 semman gp2 !!!! A.j. De Gooijer Bill aankomend scheepsgezel algemene werkploeg (asaw) 1983 a.s.a.w. When we took over in April 1979 the Felipes from the Englisch crew, we went to Dubai. I`ve never saw a boat before. We went with the whole crew to a restaurant for having diner. I ordered a pepper steak. When I got the steak, I asked officer Willem Moll for a bit of pepper. I did not exactly know what I ordered because I never heard of it. I had never been abroad before. 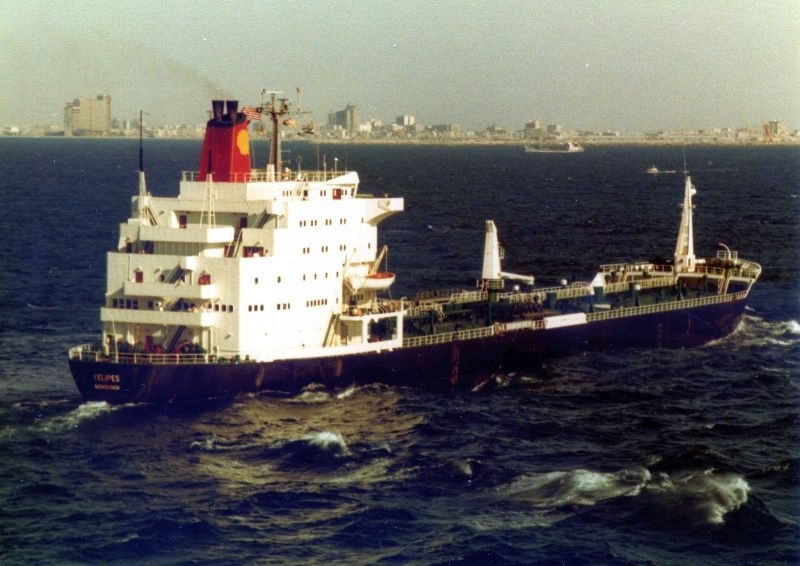 MT Felipes is First Ship of my joining with Shell Tankers BV November 1987 at Bilboa Panama and passing cannal bound for Maracaibo/Venezula load for disch.Linden/New York. With MT Felipes is the 2nd periodocal for Indonesian Junior Officer is populer call 'IJOS'.Thanks for Shell Tanker BV has been give to ourself for employ and joining the vessel for 9 month after that offsigning for vacation 2 and half month and prepare for joining the next ship. I was remember while passing Atlantic ocean on December 1987 and New year on the ocean with bad weather condition very rough sea,strong wind and very cold and temperatur minus,oh My GOD! because is the first experience for passing Atlantic ocean. In July 1988 while the vessel just sailed from New York,and received message from Representative Jakarta Office inform that my 2nd daughter was born on 26th. thanks for all parties was assist to me for it.GOD BLESS WITH US. On September 1988 at Rotterdam port we are sign off for vacation and back to Jakarta Indonesia. Thank you and heavy nice day. South Chinese Sea: am I a seagoing gardener..? Once,happy sailing onboard Felipes in summer of 1985, my job was to be officers steward. Due to this job I had to be care of cleaning officerscabins and several other spaces in ship's accommodation, serving meals in officersmess and did work in Felipes laundry. In crew's- and officersbar and officersmess this producttanker had a large numeral of pot's and hanging baskets,filled with a lot of different plants from all sizes. Once paid by the company on this tanker they looked like a mini-jungle. Sometimes when ship was in harbour,people were able to buy new plants from ship's money,given by captain. And when dockstores were coming on board,companysent small bags with fresh plantingground and artificial plantingfood were once included. Some stewards gave those plants water and the special food during work,some didn't. But when they did,only when they had plenty time. Or when they liked to look after plants very much. Most of the voyages I made, apprentices did the 'greenwork'. Or some officerswifes,who sailed with their husband several months onboard and had very much freetime...and mostly very 'green fingers'. For me,on Felipes I had no time to look after the mass of plants and as a matter of fact,I wasn't interested in it at all,so I just did nothing about it. When working more than a month onboard,the plants got more and more yellocoloured leaves,as water was not added to them by nobody at all. So,later on the captain (W.S.van der Ham) asked me about doing ship's plants. And he got angry,because I said to him I wasn't onboard just to do so. As housekeepinggroup,our group was to be smallered,because company wanted to save money on crew's occupation. So every time you came on an other ship,you got a lot more work to do,because sailors and apprentices were not minimalised,at those times. He said I was responsible for cleaning officersmess,thuss for the plants too...! I still refused and told him I wasn't to be A GARDENER at all,there was nothing standing about it in my seamansbook and on ahip's payroll...! He warned me about reporting me,due to bad behaviour and 'refusing work'. could to do the rest of greenwork,in their freetimes. He got very angry again and reported me as a very negative person in 'conduite-report',at the end of my term. But It wasn't only me he reported afterwards; nearly everyone of Dutch crew got a bad 'conduite',then. Later on,during freetime in Holland,Shell-office invided me to speak about the pro-blems on Fusus. They told me,until then captain was used sailing with foreign crew-members. And having a crew,which was speaking 'against' captain's 'ordered wishes', was quite a new thing to him,on those socalled P.L.A.-ship's. Many years later however,after a two years scholarperiod about green- and woodkeep-ing in naturereserve-area's,I had been contracted for six months to a city green-keeping department. Quite a coincidence: then my contract told me,I used to be a gardener...! Have you sailed on Felipes (3)? Log in and add yourself as a sailor to the Felipes (3)! Log in and add your personal story to the Felipes (3)!